The great thing about smoothies is that anyone can make them. You don’t need to know how to cook, they require very little equipment or preparation and almost any fruit or vegetable can be used. 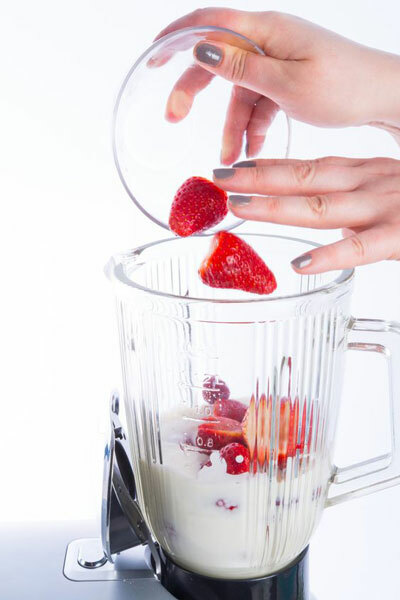 If you can chop fruit, you can learn how to make a smoothie. Made with the right ingredients, smoothies are the most nutrient dense food there is. Use them as a meal replacement, a snack or a post exercise energy boost. Although there are only a few rules to remember when making smoothies, it can become overwhelming with all the different choices. The possibilities are absolutely endless. Which fruit or vegetables do I use, do I add fruit juice, water or milk. What about sweeteners and flavorings? Use the wrong ingredients and you can end up with a sugar-laden, calorie filled monster or something brown and ugly looking. Well all of your questions are answered (we hope). All the information you need to make a delicious and healthy smoothie is right here. Simply follow our simple rules and guidelines. Learning how to make a smoothie is easy. So happy blending. All smoothies need a liquid base. It helps blend the fruit and vegetables together into a smooth consistency as the blades need to be surrounded by liquid for the blending process to be successful. The accepted ratio is normally 1 to 2 cups of liquid for every 3 cups of fruit. But of course this can vary depending on the type of fruit used. Some fruits, such as watermelon, make your smoothie watery, which means you will need less liquid. Water - If you want a non-dairy, low calorie smoothie, water is the way to go. It is recommended you use pure, filtered water. Fruit Juice - Fruit juices such as orange, apple, pineapple and pomegranate go great with smoothies. They give them that extra bit of sweetness. But do steer clear of the high sugar commercial varieties. If you have the time, freshly squeezed is best, otherwise choose a sugar-free brand. Milk - If using dairy, opt for skim or another low-fat option. Non-dairy alternatives are soy milk, nut milks or coconut milk. Nut milks are my favorite. You can use almonds, cashews, pecans or walnuts. Tea - Green tea is a common smoothie ingredient and contains valuable antioxidants. The next thing to add are the fruits and vegetables. Almost any combination of fruits and veggies can be used in smoothies. Smoothies can be fruit only or a combination of fruit and vegetables. Most people prefer to add fruit to their green smoothies. Not only do they taste better, but you get the added health benefits of both. The vegetables nourish, while the fruits cleanse. Fruit can be used fresh or frozen. Unless your fruit is fresh and in good condition, frozen is often the best choice. It is picked and frozen at the peak of ripeness and freshness, sealing in the goodness. If you have a surplus of fruit during the growing season, you can freeze your own. Using frozen fruit also has another benefit. Because you don’t need to add extra ice, the intense flavor of the fruit is preserved without being diluted. Smoothies are a great way to add some greens to your diet. Don’t worry you won’t actually be able to taste them, their taste is masked by the fruit. For those people who don’t usually like eating greens, this is such an easy and enjoyable way of getting your recommended five-a-day serving of fruit and vegetables – all in a glass. When making a green smoothie, the ratio is generally 60 percent fruit and 40 percent vegetables. This is purely for the taste. Greens on their own are rather bland and tasteless. The difference between smoothies and fruit drinks is their consistency. You will definitely need to add a thickener to achieve that characteristic smoothie creaminess and avoid a watery drink. Yogurt can also be used as a thickener and complements most fruit. But avoid the flavored, sugar-laden varieties. My favorite is Greek-style yogurt. It is thicker and creamier than normal yogurts giving your smoothies a velvety creaminess. Remember there are no hard and fast rules when making smoothies. Adjust as you go. If it’s too runny, throw in a banana. If it's too thick add more liquid. Should you add ice when making a smoothie? Adding ice will give your smoothies that characteristic chill and make them thicker and creamier, but it also has the effect of watering down the taste. If you use frozen fruit or frozen yogurt you can omit the ice. Personally, I prefer to use frozen fruit. It adds to the flavor and works as a thickener. If adding ice, start by adding about three ice cubes to your smoothie, then process on chop or ice crush for 30 seconds. If you decide you need to add more, then repeat the process for about 30 more seconds or until your smoothie is thick and creamy. Fruit smoothies generally don’t need a lot of extra sweetening. In fact if you’ve added two or three fruits to your smoothie you have reached your daily recommended fruit allowance and your smoothie will have all the sweetness it needs. Dried fruits are another good option. Because the fruit is dried the taste and sugar content are concentrated. Even adding a banana will give your green smoothies a boost. For a different taste sensation spices such as turmeric, cardamom and ginger can be used. Or herbs such as mint, parsley or basil. All nuts contain large amounts of protein, vitamin E and fiber with cancer-fighting properties. They can be added whole or made into nut milk. Protein powders are an option but not absolutely necessary if you have added extra ingredients. To keep your smoothies as healthy as possible there are some ingredients that should be avoided. Ingredients that are high in sugar and fat will simply provide unwanted calories with very little nutritional benefit.